It’s finally here! My new home “cloffice” (closet/office) is complete and I couldn’t be happier with how it turned out. I’m excited to be sharing the details and process with you today. I also did a fun Q&A interview over on Gray Malin’s blog about my decorating style, how motherhood has changed my workdays, and more. For some background on the project, I put together a pretty home office when we first moved into our house but then we had a dog (so the white carpet was a definite no) and had to turn that space into Amalia’s nursery. I loved that room so much, but it made more sense for the baby to sleep there so I gave it up. Only for her! The previously empty room (that you see here now) had basically been my closet, so I just moved all of my office furniture in kind of haphazardly. Because we’re seriously lacking for closet space in our master bedroom, the room had to serve as both an office and a closet for me which is challenging because it can get messy really quickly. For over a year, I’ve been wanting to update my “cloffice” so that it didn’t feel like so much of a mish mosh of furniture with no design element to it at all. I knew that I wanted it to feel very comfy, beachy, and homey, but didn’t really know where to start. I sit in it now and I feel inspired and excited to work instead of stuck in a rut and uncomfortable. I couldn’t be happier with it and I hope you enjoy the photos! Excuse my face, I had a terrible cold the day we shot it. Step 1: Design around one piece of art. The beach makes me happier and calmer than any place in the world, so I figured that staring at it while I work all day would bring major good vibes. The one thing that I was sure of when I started was that the space would revolve around my amazing new gigantic Gray Malin print. The other thing I knew is that I needed some help. I’ve designed most of my house on my own but I couldn’t figure out how to make this open closet more elevated. Step 2: Ask for help. In stepped Chelsea, an amazing designer at The Studio at One Kings Lane, who helped me pick pieces for the room. I told her my vibe, gave her my dimensions, shared what furniture I’d be keeping, and she created my dream office. It feels like a beach house and isn’t too fussy so I don’t have to worry about the baby and dog running around in it. It’s perfect! My favorite idea that she had was to put up pre-pasted striped wallpaper behind some of the shelves to give the closet wall a little flair. I think it looks so pretty and I would have never thought of that on my own. Step 3: Mix old and new. I knew that I wanted to keep my desk and somehow incorporate this cozy chair that had been collecting dust for months. It was originally my desk chair in the old office but I quickly realized that it wasn’t the right height for my desk so I had to swap it out for this custom Society Social one. I’m so glad I could bring it back for a little reading nook that often ends up being where Anel sits on his iPad while we meet about his business which is pretty much daily. He used to drag in a kitchen chair every time but this is obviously much easier and more comfortable. I definitely needed a new dresser because my old Ikea one was giant and clunky and starting to sag after years of use. I downsized to this pretty oak dresser which also forced me to go through my clothes and donate a bunch of them which felt amazing. There is an actual closet in the room that I wasn’t using well so I put in some shelves there for the extra clothes that can’t fit in my new, smaller dresser. Until now, there was only one full length mirror in my entire house and it’s in the guest room, so I knew that I wanted to add one in here too and I’m actually obsessed with this oversized wood framed chevron mirror. Right now it’s leaning against the wall, and is so heavy that I can’t even budge it, but we’re going to ask a babyproofing expert what he thinks in terms of safety and I’ll report back on that. Amalia isn’t pulling herself up yet so it’s as is for right now. I also knew that I wanted a sisal rug and I have two sisals from Dash & Albert already so I knew that they were soft enough to walk on barefoot and also that didn’t shed. I went with this simple rug to cover the floor. I was going to layer it with a blue and white patterned rug but ended up loving the simplicity of just the sisal. Step 4: But what about the closet? Anel installed this closet system a few months ago so that my clothes and shoes are organized. It looks really great in person and people are always shocked when I tell them it’s from Home Depot! With the wallpaper behind it, it looks even better. It also forces me to keep my clothes neat and organized which is nice. Step 5: Enjoy it. So that’s it! I accessorized with objects and things that I already had, and although it’s not always this clean, I love working here so so so much. In the mornings after I drop Amalia off at day care, I’ll drink tea in the chair with my lap top or on days when she’s home, she’ll sometimes play on the floor while I work next to her. The room feels so “me” and I feel so lucky to have this space in my home. I hope you enjoy the photos below! All product/room details are below that. Thank you to The Studio at One Kings Lane and Gray Malin for gifting me product for this room! All opinions, as always, are 100% my own. What a pretty space to work in! Love it! So pretty!!! Love everything! Random question – where did you get your phone case from? What brand is it? Thanks!! I just bought it from Nordstrom (Here: http://bit.ly/2IUNg9N) But even though it’s cute I have problems with it turning my phone off every once in a while so on the hunt for a new one! Love your office space! Definitely using it as inspiration for my next home office. Where is the acrylic jewelry organizer from? I’ve been looking for something similar to organize earrings, necklaces, etc. Thanks! Yes please let us know where the lucite jewelry storage system is from! Love! This space is beautiful! I love the multi-function that you’ve created while still maintaining impeccable style. Beautiful! 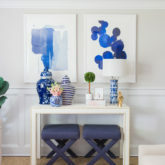 I have always wanted a large Gray Malin print like this for my office, but I have yet to bite the bullet and order one because it is just way too hard to pick my favorite. I’m curious where you purchased the “Un, Deux, Trois” art print? I love the vibes of that piece as well! Thank you for sharing your decor secrets, every time you do a decor post I can’t wait to check out the details of your space! I’m so obsessed. I had mine framed on Framebridge if you want a similar gold frame! I’m so happy for you! This looks like such a wonderful space, that is really designed for creativity and productivity. Love how it turned out! So beachy, happy and soothing. Looks gorgeous!!! I think it would be very easy to be creative in that environment!! Enjoy!! It turned out beautiful! I adore all the wall art! Your closet/office looks so beautiful & functional! And, boots looks absolutely adorable in these pictures! Love the new space! I need an office/closet like this! Just curious – where did you get the custom painting of you in the striped shirt from? I’d LOVE to get one of these done for my sister’s wedding. So pretty Julia! I love that idea and have been wanting to do something similar for a while. Thanks for the inspo! Was the wallpaper hard to install? No the wallpaper was pretty easy. The hardest part was cutting it to fit the space. Then you just wet the back and stick it up. Definitely a two person job though! The space looks incredible, Julia!! Love how you made it such a functional, inspiring place all in one. And that desk… obsessed. The “cloffice” turned out great so organized and the window adds so much light. Do you have any tips on how to store out of season clothes? For now I just move them to the top and back of my closet but then it is so cluttered. Yes! I keep them all on hangers so that I don’t have to put them in and out of boxes twice a year. I currently have all of my summer stuff in a closet in the basement hanging. For folded things and shoes, I use clear bins that are clearly labeled. I need them out of the closet I use otherwise I have the same clutter problem. He loves it haha. They are from West Elm and I have them in almost every room of our house. I LOVE them!